When Katrina Adams moved in between Sloane Stephens and Madison Keys for the final photo op at the end of the US Open’s trophy presentations, the symbolism was complete. The first African American President of the USTA standing between the first two African American players not called Williams to face each other in a Grand Slam final – and all on Arthur Ashe Stadium. If we didn’t feel Althea Gibson’s spirit watching from above, we should have because she started it all. For her it was even tougher than it was for Arthur Ashe because she was the pioneer back in those racist scarred days of the Fifties, needing to prove her worthiness after Alice Marble, a principled former champion, had sent an indignant and scolding letter to the USLTA which forced them to face reality and allow Gibson to compete in the previously lily-white US Championships at Forest Hills. Maybe some people expected it would be easier for black players to establish themselves on the international circuit after Althea and Arthur had won their Grand Slam titles and shown what African American players could achieve. But it wasn’t. Bryan Shelton, Marcel Freeman, Chip Hooper, Chanda Rubin and, more recently, James Blake and Donald Young among a few others have all fought their way onto the tour at various times. But only Zina Garrison at Wimbledon in 1990 and MaliVai Washington, also at Wimbledon six years later, reached Grand Slam finals before Venus and Serena changed the complexion of the tour in every sense. But all these African American players, no matter how successful, were sowing the seeds that kept the dream alive for thousands of black kids jostling to get court time, find a coach and persuade their parents to spent the time and the money so that they might live a dream. For those of us who wanted to help it was extraordinarily difficult to find people who were actually doing something about getting kids on courts in the inner cities. I knew something must be happening in Brixton, the predominantly West Indian district of south London, but it was no good going to the LTA for a contact. They didn’t have a clue. So, with Andrew Malim, a business partner of mine at the time, we set a trap. With the help of Richard Russell who had brought a couple of Jamaican juniors to Wimbledon that year and some ranked British players like John Feaver and Richard Lewis, we staged a Britain v Jamaica match on the public park courts at Clapham Common. Illegally, we plastered the area with posters and waited to see what would happen. Not many people turned up but one athletic looking guy in a track suit caught my eye. I introduced myself and discovered he ran a training program in nearby Brockwell Park. Bingo! “You’re the man I’m looking for!” I said and, with Orville Brown’s invaluable help, we never looked back. I got Harry Hopman, Arthur Ashe and Vitas Gerulaitis to come by and watch the kids training with Orville in the park and, with the help of Mike Silverman of the New York City Parks department we set up a London v New York Grassroots Challenge. After a brief hiatus, I was able to enlarge the idea considerably when I joined the ATP in the days when Lufthansa was a sponsor. Rolf Hoehn, who now heads the promotions department at the Indian Wells Tennis Garden, was the airline’s PR man at the time and he provided air tickets so that we could fly in two 14 or 15 year olds and a coach from programs as far flung as Madras, Melbourne, Soweto in South Africa, Jamaica and cities all over the States, including Boston, Washington DC, Los Angeles and Palo Alto, California. Almost all the kids had never been on a plane before so the project was as much about education as tennis but it worked and it was amazing to see how curious a bunch of black, white, Christian, Hindu and Muslim kids were about each other and how quickly they became friends. For a variety of reasons, the Gerulaitis Grassroots Challenge, as we called it, couldn’t survive for more than half a dozen years but I mention it because, although our players never made it onto the pro tour, tennis had offered them new horizons and we had spread the word. 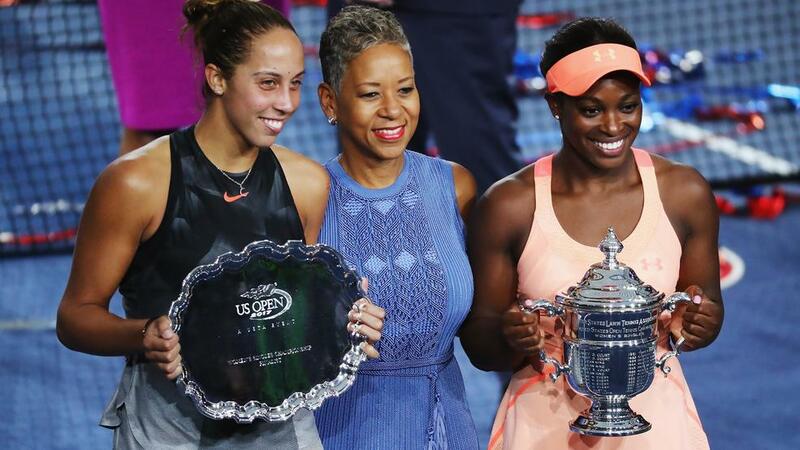 So the sight of Sloane Stephens and Madison Keys hugging each other at the net as tears flowed became a symbol of a long struggle, for themselves, as well as their fellow African American players. No one needed to tell those two how tall a mountain they had climbed or how much they owed to those who had helped them and believed in them. I had watched Sloane and Madison being put through their paces by John Evert at the Evert Academy on Boca Raton when they were young teenagers. Both looked so talented and full of promise and many of us started predicting big things for the pair of them a bit too soon. It took a while, as things do when you are fighting injuries and trying to live up to high expectations in a daunting, high pressure world. Now they have made it. Ignore the score in the final. Sloane thoroughly deserved her win and Maddy will return to this level to do herself justice in the future. Using the depth of their friendship they will urge each other on and continue to show kids striving away on public park courts all over the world that you really can live the dream. There is much more to be found on Althea Gibson and Arthur Ashe in The Roving Eye, Richard's autobiography on sale on Amazon.